Photo courtesy of JupiterImages 2009. Last year during the Greenbuild Conference & Expo, a panel presentation on Masdar City, Abu Dhabi, caught my attention. According to the panelists, Abu Dhabi has the largest per capita carbon footprint in the world. To counteract this problem, Abu Dhabi has plans to build the first carbon-neutral, zero-waste city in the world. The speaker presenting the plans for Masdar City explained that their computer analysis had proven that historical city planning was the best choice to make to achieve the set sustainability goals. Such traditional, local concepts as massive walls, narrow diagonal streets, walkable neighborhoods and flat, accessible roofs have been essential in designing the carbon- and waste-neutral community. Once again, designers have had to go back to old architectural concepts for the design of environmentally friendly buildings and sites. It is time to analyze why previous generations made important buildings out of masonry. Their buildings looked beautiful, functioned well, and served as cultural heritage for generations. Old masonry buildings around the world are signatures of the past teaching us about the character of their builders, and their way of life. Many of these buildings have passed their 100-year anniversary, if not many hundreds, and have proven sustainable through fires, earthquakes and natural wear and tear. They talk to us about the people who designed and built them, decorated them, and lived and worked in them. Old masonry buildings are, in a sense, illustrative history books that are beautiful, live and inviting. Yet today, when we talk about green, sustainable, or high-performance buildings many of us don’t consider the fact that aesthetics and long life are the most important sustainable factors in building construction. We should ask ourselves: “Is a beautiful building more prone to demolition or an ugly one?” or “Is it more resource efficient to build a building for a life span of 100 years or just 30 years?” The slogan of our past generation was: “We are not rich enough to buy cheap products.” They knew that if they bought cheap products they would have to repair or replace them in a short period of time. They knew that it would cost them more in the long run. Our grandparents guided us to Lifecycle Cost Analysis. Aesthetics is a major issue that is mostly overlooked in sustainable evaluations. It is more likely that people hold on to their beautiful buildings longer, and use them adaptively. Beautiful buildings also are a major key in the existence of lively, interactive neighborhoods where people tend to spend more time outdoors with their neighbors strengthening their social values. Beautiful outdoor spaces can help create better spiritual mood for occupants as well as passers-by. Thermal mass of masonry results in lower energy consumption for buildings. With proper detailing, masonry walls and floors can save energy, especially during peak hours. According to ASHRAE 90, a lightweight stud wall needs R-19 for adequate insulation, whereas a masonry wall needs only R-10 to R-12.5 to match the same insulation capacity in Denver. 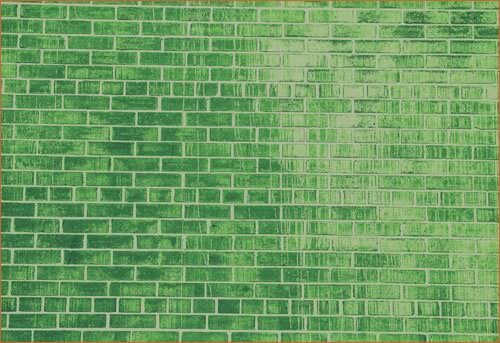 Masonry walls do not need to be covered with finishing materials. This eliminates potentials for VOC, and mold. Brick, block and stone can be used as exterior and interior finish without the need for paint or other covering material. This means less maintenance, as well as good indoor air quality. Mold has been a great concern for the building industry over the years. Masonry is a mold-resistant material since it does not contain cellulose, which is the food for mold. Indoor air quality has been found to be effective on occupants’ health and productivity. Fire safety of masonry buildings can help build dense and beautiful neighborhoods. Dense city planning provides for walkable and pedestrian-friendly neighborhoods and makes possible expanded use of public transportation, decreasing the need for use of fossil fuel. The natural, fire-resistant properties of brick, block and stone make them a natural choice for new, dense neighborhoods where fire safety is an issue. Masonry also provides security for buildings against vandalism because of its strength against cuts and impact loads. Most metal products use between one percent to 30 percent of the excavated ore in their production and the rest goes to landfill, which means larger volume of resources excavated for a certain amount of metal production. Masonry, however, is a resource-efficient product which is made of abundant material, such as clay and sand, with more than 90 percent of the extracted material ending up in the finished products. Resource extraction for masonry has minimal impact on the environment from non-toxic mining practices. Some old masonry mining sites have been rehabilitated and used as golf courses, sport stadiums and parks. In the area of water efficiency, reduction of landscape irrigation is a major factor. Masonry pavers can be used in xeroscaping and can decrease irrigation needs while creating a beautiful landscape design. Pavers are long-lasting, can be designed with different patterns, and are a good replacement for turf. Masonry buildings are the best candidates for adaptive reuse, which is the best recycling strategy. Salvaged masonry from demolished buildings can give character to a new project. Masonry manufacturers can use recycled content such as fly ash, slag and crushed masonry from demolished buildings to make new concrete block. We need to have a deeper understanding of recyclable building materials to make the right choice. For instance, a good portion of steel recycling takes place in China. In addition to the large amount of energy used in the recycling process, transportation of steel to and from China is a source of pollution. Is our vision deep enough when designing a “green building”? For example, during the past few years, bamboo flooring has been considered sustainable just because bamboo is a fast-growing plant. Is the fast growth all that matters? Or do we need to pause and ask: “Where does bamboo flooring come from? How much water and energy is put into its growth, process, manufacture and transfer to the job site? How well does the floor function? How much maintenance is required to keep it in good shape? And finally, how long would the floor last before it needs to be replaced? To further explain the deeper vision concept in our example, I refer to a study done by Symbiotic Engineering, a company that specializes in greenhouse gas and sustainability management. 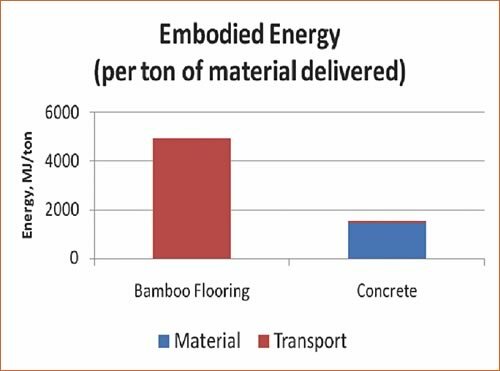 The following charts compare the embodied energy and greenhouse gas emissions of bamboo flooring with that of concrete. General perception on concrete and any cement-based product is that they account for a lot of greenhouse gas emissions. 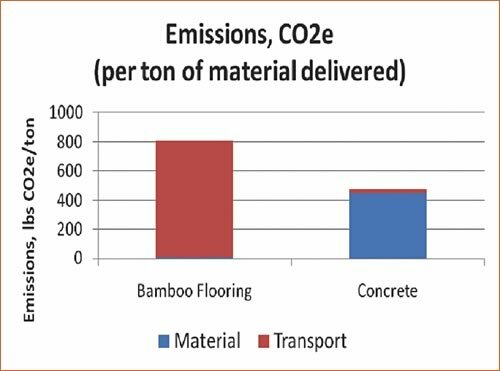 The following charts show, however, that the impact of transport alone for bamboo flooring on the environment is many times that of concrete manufacture and transport put together. Conversely, the life of concrete flooring is many times longer, with little or no maintenance required. Shahnaz Jaffari is the sustainability director for Rocky Mountain Masonry Institute. She holds Master’s degrees in Construction Engineering and Management from University of Colorado Boulder, and in Architecture from the University of Colorado–Denver. Jaffari is a LEED Accredited Professional, and has served a two-year term as a representative of Colorado at the USGBC. She chairs the Colorado Regionalism Task Force, where regional credits for LEED 2009 are being developed. She is a member of the AIA Committee on the Environment, and it’s Advocacy Subcommittee. She sits in the Steering Committee for Colorado Alliance of Sustainable Business Associations, where policies are developed on further greening Colorado businesses. While concert-goers enjoyed the inaugural Big Gig live music festival this past Fall, and many of them admired the beautiful new Alton Riverfront Amphitheater where the event was held, most of the music lovers weren’t aware of the balance and harmony of materials utilized in the creation of this magnificent outdoor venue located in scenic Alton, Ill. 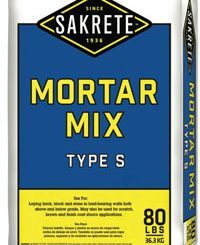 Typically used for new construction and repairs, Sakrete Type S Mortar Mix is a contractor-grade mortar mix. It’s a smooth blend of sand and masonry cement or sand, lime and portland cement depending on your geography. Sakrete Type S Mortar Mix is for the laying of brick, block and stone in load-bearing walls and construction below grade.